After watching Disney's Hercules, my wife and I followed it up with Disney's Tarzan, another one of the five classic titles Disney released blu-ray a few days ago, the others being Hercules, The Three Musketeers, The Adventures of Ichabod and Mr. Toad, and Bedknobs and Broomsticks. We both enjoyed Tarzan a bit more than Hercules, though both movies were entertaining. Tarzan felt like it had more of a unique art style than Hercules. Both also mixed some 3D animation into the 2D aspects remarkably well. In this version of the Tarzan story, the infant Tarzan and his parents become stranded in Africa after their ship burns to the ground... er, water. But they don't let a little disaster like that get them down! Nope, the say screw it, this is our new home and proceed to build a very nice tree house. But then tragedy strikes in the form of a leopard and Tarzan is all alone. That is until a gorilla named Kala finds Tarzan, rescues him from the leopard, and raises him as her son. Many years later another ship arrives, and among the humans are a father-daughter team, Professor Porter and Jane, and their guide Clayton. Now while Professor Porter and Jane are there to study gorillas, it's obvious from the get-go that Clayton is there for some far more nefarious purpose that just protecting Professor Porter and Jane. He's a very two-dimensional character which is a shame since stories tend to be better with more interesting villains. Anyway, when Jane gets separated from her father and Clayton, her curiosity gets the best of her and winds up being attacked by a whole lot of monkeys. Tarzan, witnessing the whole situation, heroically swoops in and saves her. Not only is this the first human he's ever seen, but this particular human just so happens to be a beautiful girl, so you can imagine his excitement and curiosity. The interaction between them feels very natural and is quite entertaining. This film didn't have as quite as much humor as Disney's Hercules, and the humor it did have was of a different type. It was less pop-culture reference humor and more fish-out-of-water humor. Even though Tarzan doesn't actually leave the jungle, he does stay in his new friends' camp and learns about their culture and language. Also different from Hercules is the music. The soundtrack to Tarzan was done completely by Phil Collins. I neither love nor hate Phil Collins, and some of the songs were kinda catchy, but I really would have liked a little variety. I'd even been okay with all his songs if they could have just gotten some other people to sing a couple of them. Like the Hercules release, this set comes with a blu-ray disc, DVD, and digital HD copy. There are also extra features, but there seem to be more on this one. There are deleted scenes, a feature length commentary track (which is quite a treat to listen to), a bunch of behind-the-scenes featurettes which go into the history and development of the film, the characters, the deep canvass process, making the story, the music, and more. The extras here definitely add value. An enjoyable movie with a lot of good extras make this a nice release. 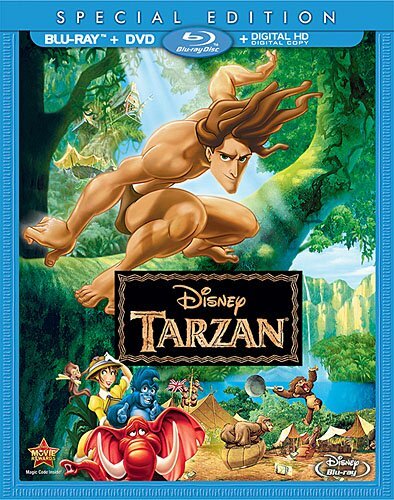 Disney's Tarzan Special Edition (Blu-ray + DVD + Digital HD) , released by Walt Disney Video, is available starting August 12, 2014.